End On the north side of Highway 88, 2.0 miles west of Tragedy Spring, 1.4 miles east of Shot Rock Vista and 2.2 miles east of Mormon Emigrant Trail. The end is at a point where the highway forms a saddle with the lands dropping away to both the north and south. This tour is a variation on the Ridge West of Shealor Lakes tour, but unlike that tour, this tour is one-way and returns through a drainage that is seldom visited. Also unlike it's sister tour, this one stops 0.8 mile short of the abrupt drop into the Shealor Lakes drainage. But don't despair, nothing is keeping you from continuing the additional 1.6 miles and +400, -400 feet round trip to the drop. Regardless, Peak 7617, the destination on the ridge of this tour, provides a delightful vista to the north including Pyramid Peak. Unlike most tours, you climb 200 feet in the first 1.0 mile to the highest point and then descend 500 feet in the following 0.6 mile. You will find some modest terrain, but the descent is steep at times and through trees; it requires the ability to turn quickly. As you might expect, after a storm you are likely to find powder in the wooded section of the ridge. You need to be aware that parking at the end point of this tour only exists if the snowbank along the north side of the highway has receded due to melting or Cal Trans has plowed enough room for you to pull off the highway. You should never park here if there is any chance of plowing taking place. On the positive side, the orientation of the parking area results in the snowbank receiving the full brunt of the sun's rays and therefore melts fast. Consider doing this tour in the spring when you are more likely to find parking. Also be aware that you will need to cross two creeks on the route back to the highway. Also part of the route within the drainage faces south. The bottom line is that you don't want to visit this area too late in the spring. From the trailhead (1) ski northwest on a snow-covered road for 0.1 mile until you reach a location where you can easily leave the road to the north (2). The location where you leave the road is not critical. However, leave the road at a small sign on the right-hand side of the road indicating a buried fiberoptic cable if it is visible. Turn north and ascend for 0.2 mile until you reach a saddle (3). Ski northwest, then southwest and finally west on a broad ridge for a total of 0.7 mile until you reach Peak 8096 (4) and the high point of the tour. Descend northwest on the ridge, which is now narrow, through trees for 0.6 mile until you reach Peak 7617 (5). Do not make the mistake of turning west just before reaching Peak 7617. Retrace your route south for 0.1 mile until you reach a location where you can descend to the southwest (6). Descend to the southwest for 0.4 mile until you reach a location where it is convenient to cross the creek and traverse to the south (7). In this section you will be skiing through a combination of woods and rocks. Sufficient snow will eliminate difficulties that could exist as a result of the rocks. Traverse southwest and as you near a second creek begin to climb parallel to it and slightly east of south for a total of 0.6 mile until you reach a location where you can cross the small drainage and continue to the southwest (8). 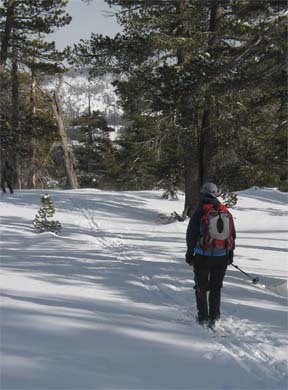 Ski southwest and climb for 0.3 mile until you intersect a snow-covered road at the base of a steep slope (9). Ascend the snow-covered road to the west for 0.1 mile until you reach the end point (10).